There are, in the upper ends of society, a lot of people who sometime want other very rich people dead. Sometimes they want to steal each other’s information. Sometimes they just want to torment someone. The more “in” gadget for these and more is the iSlayer, a gadget from the (utterly coincidentally named and branded) Ananas Corporation. Now in it’s seventh incarnation and standing at 2ft tall, it features a practically indestructible ceramic body, a retractable titanium blade, a grappling hook arm with a 150ft cable, automatic hacking systems and a large brace of darts which can be modified on the fly for adjusting to any scenario. This latest version has a 28% longer battery life and significant upgrades to the dart system. The darts can be loaded with a huge range of payloads from an internal library including EMPs, over kinds of nanite and over 1000 poisons. It can be programmed to use specific “playlists” to blind, paralyse, knock unconcious, cause vomiting in or kill the target. The most popular feature of this model is the new “shuffle” option which will randomize the poison payload of darts so as to make recovery all but impossible due to multiple exposures. 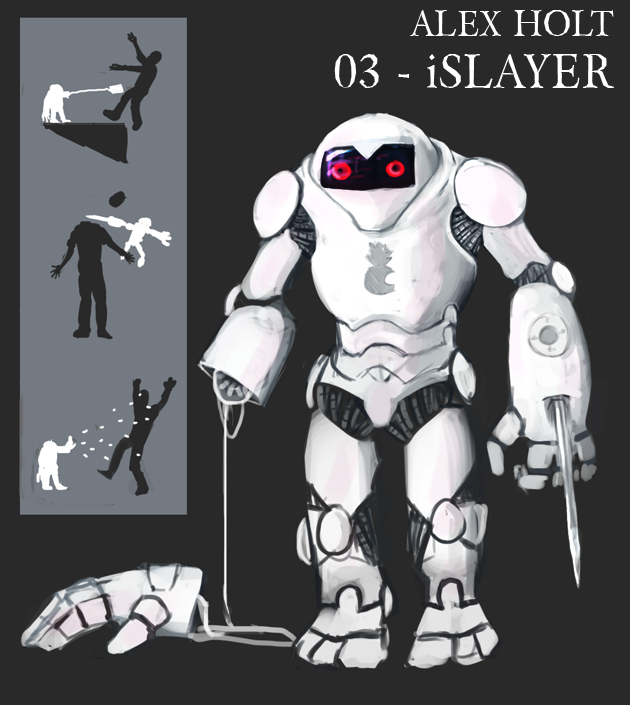 iSlayers can also be used for personal defense against human and robotic opponents, and can connect to a network to co-ordinate with multiple iSlayers you may own. Retailling now for a mere $3,500,00 each! For my third entry I wanted to produce something inorganic, and decided to produce a robot in the current fashion-technology style. I have to say, getting legs to look right on robots is never easy and this could probably have done with a “floor” to improve it. I would love to see someone produce one of those Apple adverts for this thing with the kind of things the little side panel shows, it would be great fun.